Are you ready to get published and WRITE Your Cash Machine? You can begin TODAY by enrolling in this unique home study course. When you follow my signature system you can guarantee your success as a published Indie Author in 7 days. 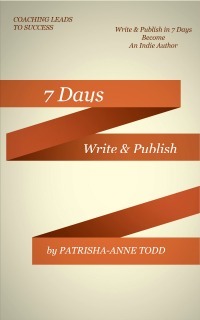 I'm delighted to share my signature system the exclusive '7 Days Become A Published Author' delivered in pdf. format to your in-box, ready to print off and keep and refer to as you work through each of the steps this is the same system I have been helping aspiring authors find their unique message and create an income stream from their knowledge, life experience and work. During the 7 days you'll focus on your writing and delivering your message. I'll lead you through the five step system one step at a time. You'll have a plan of action to take you forward. Each day you'll tap into the system designed to shift your way of thinking and break habits that no longer serve you. You'll BE the person you desire to be and get your ideas out of your head and written onto paper. You'll unlock your true writing potential as you craft your message to deliver to the world. The formula you'll find in this 7 days system will give you the juice to write your book and get published as if by magic. You'll natually find your own inspiration and writing launch pad to becoming published. From day 1 your mindset will shift ino a higher gear and you'll quickly understand and completely know your 'Why'. The 'why' you want to write and more importantly what you want to write about which will logically lead to you experiencing better results. During the 7 days if you put in the effort your results are guaranteed. This coaching programme is an opportunity for you to share your knowledge with the world wide web and seriously grow your list, to increase your client base and begin your writing journey to reach five, six even seven figures. You know you deserve it! Writing is about sharing your story with the outside world and helping others achieve more in their life. So why not write a quick read ebook and become a published author in 7 days!